Isaac Dobrinsky was born in 1891 in Makarov, Russia (now Ukraine). After studying in a Talmudic school, he moved to Kiev for six years, where he began to model figures in clay. Afterwards he studied at Sabatovski art school while working for a tin can maker. Dobrinsky arrived in Paris in 1912 and was welcomed warmly by the sculptor Marek Szwarc. He settled at La Ruche alongside Kikoïne and Pinchus Krémègne, and briefly shared his studio with Soutine. In 1914, Dobrinsky joined the French Foreign Legion, but was quickly exempted for medical reasons. He returned to Paris and studied at the Colarossi Academy and met Vera Kremer, who he married in 1926, and who is the subject of many of his paintings. After living at La Ruche for 27 years, Dobrinsky moved to Rue d’Odessa in 1934. In 1942, he left Paris for Bergerac, where he found refuge and met Hersch Fenster (who befriended many painters) and his family. He returned to Paris after the Liberation. 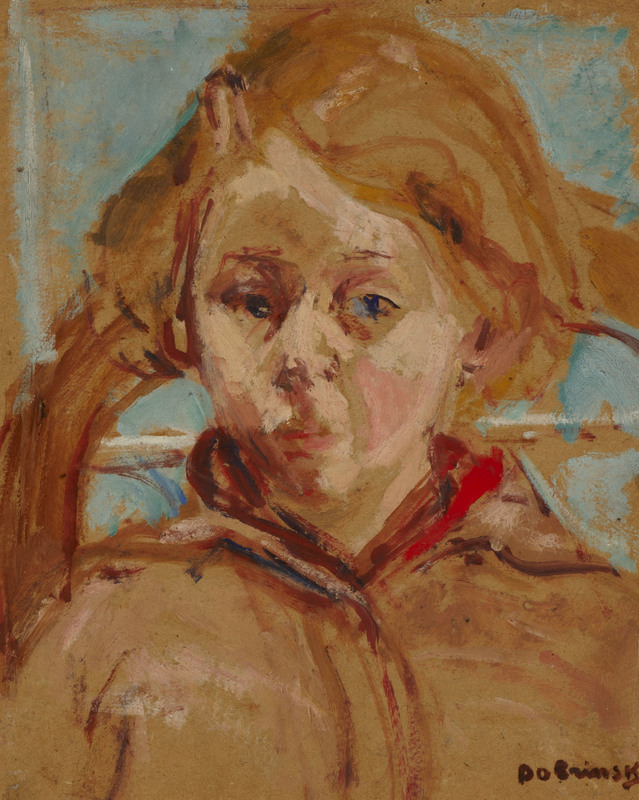 In the 1950s Dobrinsky worked at the Chateau de Chabannes, Limousin, a home set up by Serge and Rachel Pludermacher to care for around 200 children orphaned by the Nazis, where he painted numerous portraits of the staff and children. Dobrinsky died in Paris in 1973. In Head of a Girl, Dobrinsky portrays a young girl, perhaps an orphan, whose tight-lipped mouth, fixed stare and adult expression appear to express disenchantment perhaps with the harshness of life. In contrast to her dark expression and bare surroundings, the painter uses a light, luminous, warm palette and lively brushstrokes.